Saturday May 28th 1881 I felt wretchedly bad all day, but about four oclock I felt a little better and went over to Hatts. I hadent much more than got there till it looked so much like rain I hurried home. 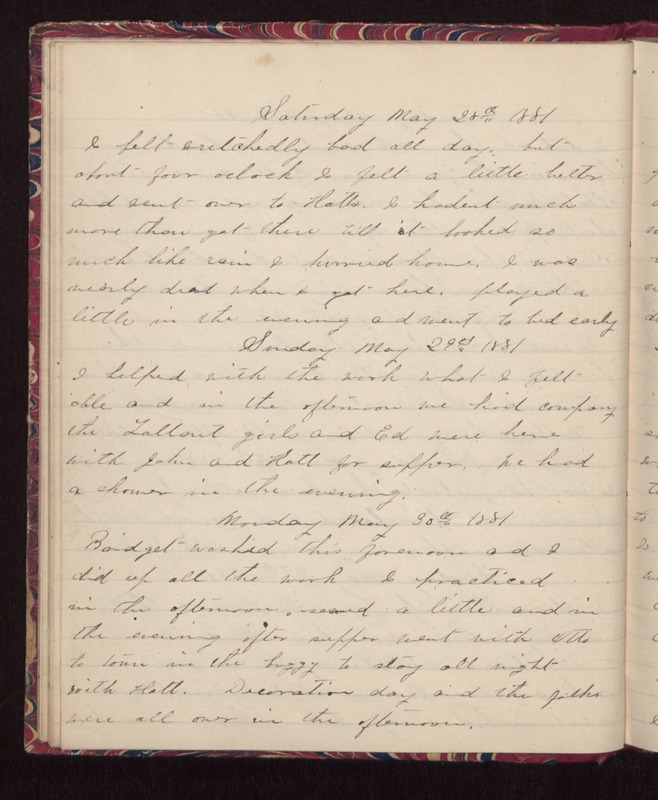 I was nearly dead when I got here, played a little in the evening and went to bed early Sunday May 29th 1881 I helped with the work what I felt able and in the afternoon we had company the Tallant girls and Ed were here with John and Hatt for supper. We had a shower in the evening. Monday May 30th 1881 Bridget washed this forenoon and I did up all the work. I practiced in the afternoon, sewed a little and in the evening after supper went with Otto to town in the buggy to stay all night with Hatt. Decoration day and the folks were all over in the afternoon.